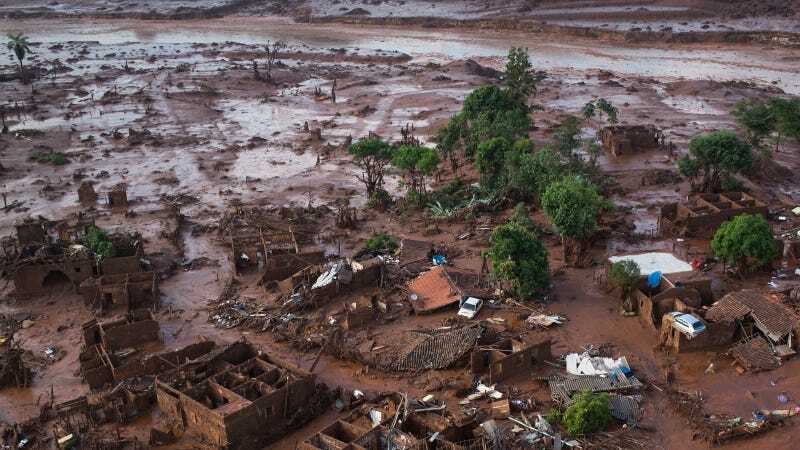 On November 5th, two dams collapsed at an iron ore mine in southeastern Brazil some 200 miles north of Rio de Janero. The ensuing flood of 50,000 acre feet—the volume carried by about 187 oil tankers—of mining mud ripped through a dozen or so communities and killed at least 11 people. The disaster will likely cost several billion dollars and it will take decades for the area to fully recover, even as some areas may never be the same. For now, 17 people remain listed as missing, more than 600 have lost their homes and 250,000 still don’t have access to drinking water. Some 15 million people have been affected overall. At the same time questions remain over what could have been done to prevent the catastrophe and how much responsibility lies with the mine's owners, a joint venture between Brazil’s Vale SA and Australia’s BHP Billiton. Vale, the world’s biggest iron ore producer, plays an important role in Brazil's economy and the Brazilian government is a shareholder in the company. Brazil's Minister of Mines and Energy has asked for caution in investigating the accident, and to avoid rushing to judgement. The relationships between large corporations, state agencies and ruling political parties around mega-projects in the mining and energy sectors are notorious for their rampant corruption. Brent Millikan, the Amazon program director at International Rivers, told Fusion that the oversight capacity of government agencies is significantly weakened "by the fact that powerful corporate actors, such as Vale, are major campaign contributors to the major political parties that control the federal and state governments." "The relationships between large corporations, state agencies and ruling political parties around mega-projects in the mining and energy sectors are notorious for their rampant corruption," he said. Millikan said that the environmental assessments for these types of large projects seriously downplay "socio-environmental risks" and that "enforcement of risk prevention and mitigation measures is extremely weak." A 2013 report on the dam, before the mine's license was approved, found a flaw in the dam's design that could lead to a burst. As ABC reports, the mine license was apparently granted without anyone checking that the design problem with the dam had been dealt with. BHB has said that these issues were not the cause of the failure. On Thursday, November 12, a full week after the initial breach, Brazilian president Dilma Rousseff flew over the devastated region, which extends hundreds of miles along the Rio Doce, or "Sweet River," and links mineral-rich interior areas with the Atlantic Ocean. She called the situation an "environmental catastrophe" and compared it to the the 2010 Deepwater Horizon offshore oil spill, which killed 11 people and spilled over three million barrels of crude oil into the Gulf of Mexico. We have to remember that this isn't over yet, and that the toxic sludge continues down the river. In the aftermath of the incident, Brazil's national water agency has warned of the presence of arsenic, zinc, copper and mercury in the Rio Doce, making it untreatable for human consumption. Much of the aquatic life along the river has also been killed by the lack of oxygen and high temperatures caused by the pollutants. Biologists are working to rescue fish from the river by placing them in large tanks and new wells are being dug alongside the river to provide potable water. Ricardo Baitelo, the climate and energy campaign coordinator with Greenpeace Brazil, told Fusion that a "toxic sludge" released by the dam is killing fish and animals. He also said that at least 15 cities are facing a state of emergency and that "hundreds are homeless" and have lost all their belongings. "The impacts right now are huge, but they can get much worst," he said. "We have to remember that this is not over yet, and that the toxic sludge continues down the river, passing through cities and killing nature." The mudslide is anticipated to reach the Atlantic Ocean this week, and the potential impact on fishing and coastal communities could be devastating. The mouth of the Rio Doce is also a nesting spot for endangered sea turtles, which are very sensitive to changes in habitat. Aerial view of the small town of Bento Rodrigues after a dam burst on Thursday in Minas Gerais state, Brazil, Friday, Nov. 6. On Thursday, Rousseff said the mine’s operator, Samarco Mineração SA, and its two owners, Brazil’s Vale SA and Australia’s BHP Billiton, broke federal laws. She also announced an initial $66 million fine against Samarco and said all three companies would be held further responsible. On Monday, Brazilian state and federal prosecutors announced the companies had agreed to pay $260 million to cover compensation and clean-up costs. According to Mac Margolis, a Bloomberg View contributor in Rio de Janeiro, the Brazilian government's response has been far from adequate. On Friday, November 13, Margolis wrote that while "we don't know what went wrong at the iron mine," we "do know what went wrong after the disaster." "For days, while response teams scoured for survivors, Brazilian national authorities said next to nothing," he writes, saying that even in her "belated tour" of the disaster, Rouseff sounded "strangely upbeat." As for the mine owners, the chief executives of BHP Billiton and Vale gave a press conference on November 11 in which they apologized for the disaster. However, they did not comment on a report from a state prosecutor asserting that there is evidence Vale was depositing extra waste water from another mine behind the dams in the period leading up to the collapse, potentially putting the dams at or above their safe capacity. The companies were also in the process of raising the dam wall—a cheaper fix than replacing it. BHP recently called for a probe to determine the cause of the disaster, with chief executive Andrew Mackenzie saying the joint inquiry from the three companies will work “night and day” to get to bottom of the dam failure, an undertaking that is expected to take less than a month. The lack of an evacuation plan also has many up in arms. Sandra Cureau, a federal prosecutor in Brazil’s attorney general’s office who is responsible for environmental issues, told the Wall Street Journal that the dams should not have been approved without an alarm system installed in case of failure. People carry an injured dog they rescued in the small town of Bento Rodrigues, which flooded after a dam burst in Minas Gerais state, Brazil, Saturday, Nov. 7, 2015. Duarte Junior, the 35-year-old mayor of Mariana, the municipality where the mines collapsed, told ABC that what bothers him the most is the absence of a real emergency evacuation plan. "The only way to reach people was by phone," he said. "Because of that, people died. People have lost their houses. And that is the fault of Samarco." Despite the tragedy, Junior is not advocating for the mines to be closed, as mining revenue accounts for around 80% of the city’s annual budget. At least one positive outcome could result from the catastrophe: on Monday, BHP Billiton said it is reviewing two other mining joint ventures in South America following the collapse in Brazil. Perhaps the residents near these two massive projects—an open pit coal mine in Columbia and Peru's biggest copper and zinc mine—will be spared such environmental calamity.